A personal experience...luxury accommodation, contemporary dining, chic day spa & kid's playground, function & event space for any occasion...only 2 hours south of Sydney & 5 mins from beautiful Werri beach! Mercure Resort Gerringong offers guests a personal experience...with views overlooking the mountains, across protected wetlands and back to the sea. Mercure Resort Gerringong is a small luxury hotel with 52 contemporary king bedded guest rooms, a chic restaurant & wine lounge, an indulgent day spa, 2 pools, a tennis court and kids playground, and function and event space for any occasion. Mercure Gerringong is just 2 hours drive south of Sydney, 30 minutes past Wollongong, 500 metres from Werri Surf Beach and 1km from Gerringong town centre. Mercure Gerringong is a place to holiday, host an event, hold a conference or get married! Come and experience all that Mercure Gerringong and the lovely sea side village of Gerringong has to offer. Garden View & Balcony rooms have a king size bed and either a large chocolate leather lounge OR a cream leather sofa bed to accommodate up to 3 adults OR 2 adults & 2 small children. Bathrooms have either a bath with shower overhead or a large walkin shower. Rooms have either a "Limited" kitchen with a small fridge, microwave oven, toaster, tea/coffee facilities & crockery & cutlery. A "Galley" kitchen which additionally has a large fridge, 2 burner cooktop & dishwasher. Dont forget to make a dinner reservation amazing Bella Char Restaurant & Wine Bar AND to book in at Bella Spa for some papering! Happy Hour Fridays & Saturdays from 5 to 6pm High Tea 1st & 3rd Saturday of each month 12 to 2:30pm $39 per person Sunset Special Menu Monday - Friday 6 to 7pm $38 per person for 2 courses & glass of wine Wedding Open Day - Saturday September 5th. FREE entry. Fathers Day - Sunday September 6th - Brunch & Live Music $45 per person. Bookings essential. Only 2 hours drive south of Sydney, along the Princes Highway and 8 minutes past Kiama is Gerringong, the seaside village where the mountains meet the sea. Balcony rooms are beautifully styled in rich chocolate & white featuring crisp white bed linen, bed doonas. 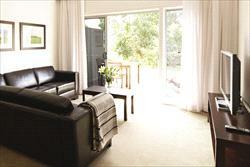 These rooms have a balcony looking towards the east out over the hotel gardens, wetlands and towards Werri Beach. Bathrooms have shower over bath or you can request a room with a walk in shower. The perfect room type to watch a glorious Gerringong sunrise! Curl up on your leather couch with a DVD or inhouse movie and RELAX!